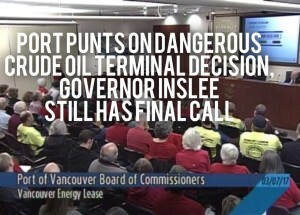 In a 2-1 vote, the Port of Vancouver Commission allowed its lease for the Tesoro Savage oil terminal to extend for an additional three months, despite growing pressure on the Port to pull the plug on the languishing, unpopular proposal. Tesoro Savage has proposed the largest oil-by-rail terminal in North America, capable of shipping 360,000 barrels of crude oil each day. Already, the Cities of Vancouver, Washougal, and Spokane, Columbia River Treaty tribes, ILWU Local 4, Vancouver’s Waterfront Development Project, the Fr uit Valley Neighborhood Association, the Washington Department of Natural Resources, and Washington Attorney General Bob Ferguson have called on Washington’s Energy Facility Site Evaluation Council (EFSEC) to recommend denial. Vancouver’s Port Commission negotiated for the ability to terminate its lease for the Tesoro Savage oil terminal project, but it chose not to use this provision in its lease agreement. Commissioner Eric LaBrant supported termination of the lease, saying, “Right now I see zero permits and zero jobs. It’s time to move on.” EFSEC is expected to make a recommendation in coming months, after which Governor Inslee will make the final decision about the project. Far from Vancouver, communities along likely oil train routes have been vocal in opposing the Tesoro Savage oil terminal. The Port’s next opportunity to terminate the lease comes at the end of June. EFSEC is expected to hold at least one public hearing this spring about air pollution from the oil terminal and to finalize its environmental review soon thereafter. EFSEC plans to make its recommendation to Governor Inslee by the end of June, roughly one year after the oil train derailment in Mosier, Oregon. Governor Inslee’s final decision is expected in 2017.